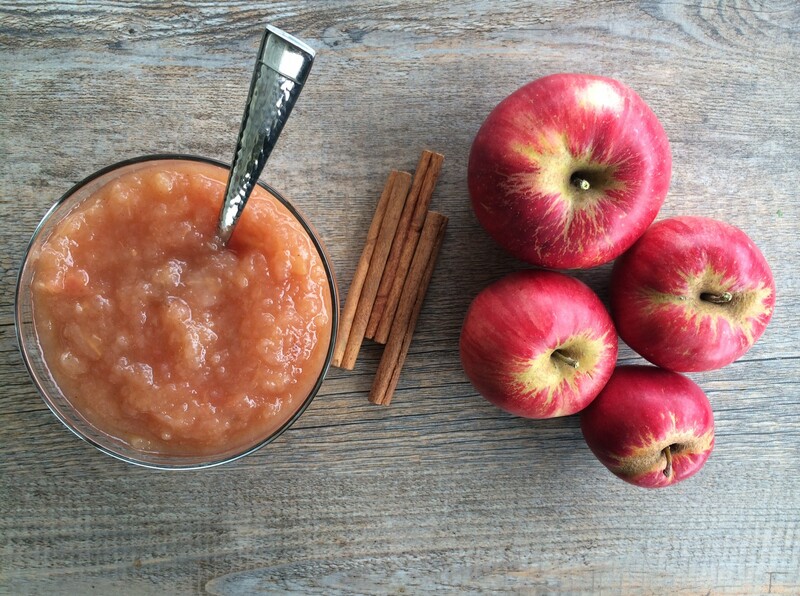 Applesauce is a breeze to make if you have some sort of apple peeler or spiralizer. Our apple peeler did all the dirty work for us, and pretty much made it so we didn’t even have to puree the applesauce when it was done cooking. They were sliced so thin they pretty much melted right into applesauce! I remember as a kid, I HATED applesauce. What was wrong with me? My poor mother. 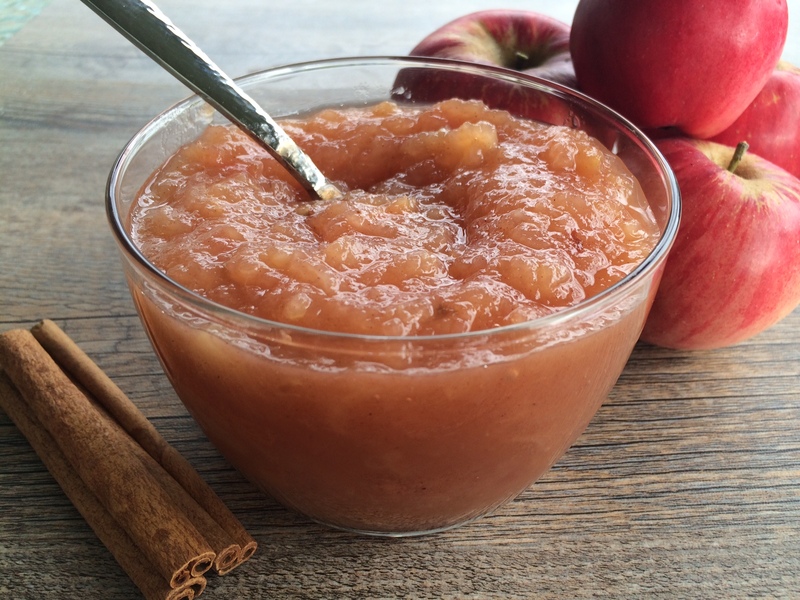 Applesauce is the perfect snack, and it can be incorporated into so many things (Pork Chops, pancakes, breads, muffins, stirred into yogurt)….and homemade is the only way to go! 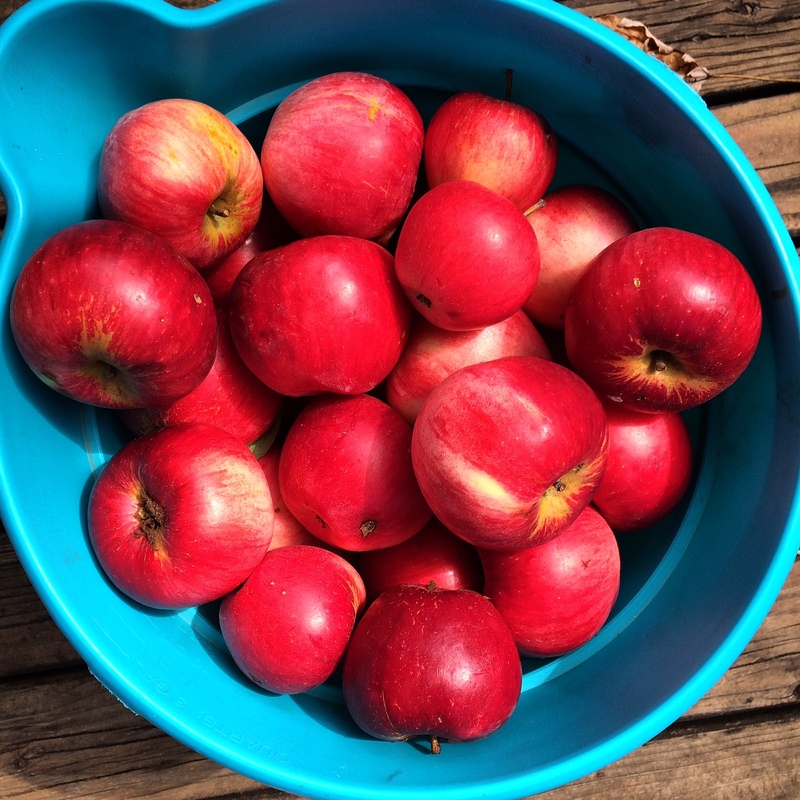 Wash, peel, and core apples. 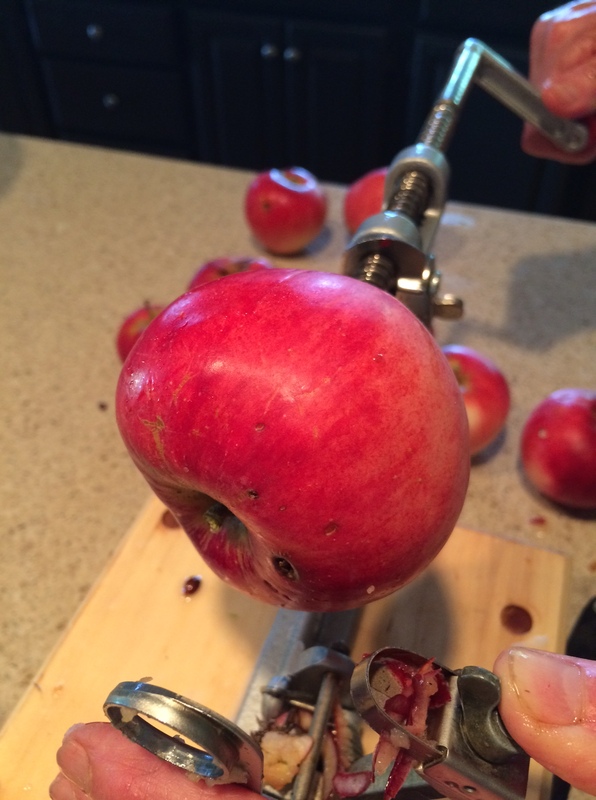 Cut apples into thin slices. We used an apple peeler, you can also use a spiralizer, mandoline, or do it by hand (this took care of all of the hard work for us). 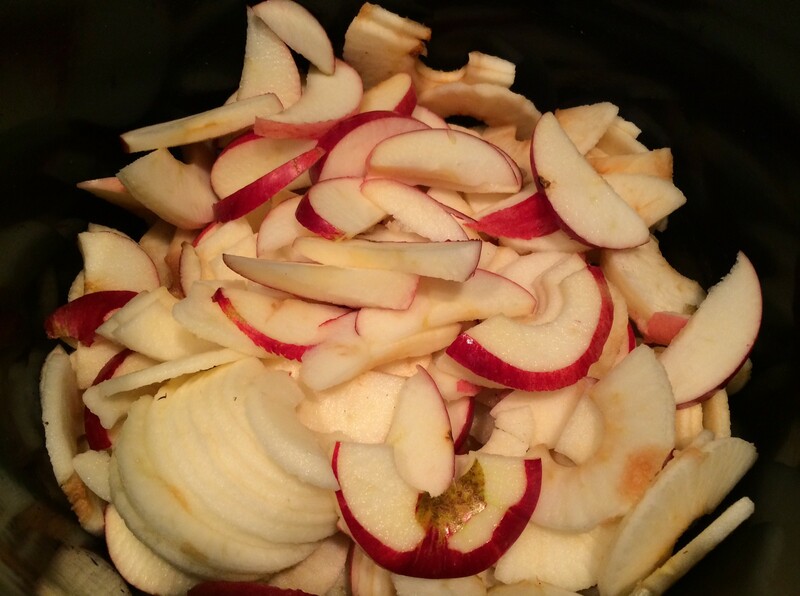 Discard the core and add thinly sliced pieces of the apples to a large pot. Add water (or juice), lemon juice, cinnamon sticks and cloves to the pot and cook over medium heat, covered and stirring occasionally, for about 25 minutes. Taste, and add some sugar. We started off with 1/2 cup brown sugar and then added about 1/2 cup of white sugar. Add a little at a time until it suits your taste. Feel free to add more spices, such as pumpkin pie spice, allspice, or nutmeg. Discard cinnamon stick and any cloves floating around. We are pretty lazy and just like to keep them in the sauce, so we can let more flavor get infused the longer it’s in the fridge. You don’t have to be weird like us. 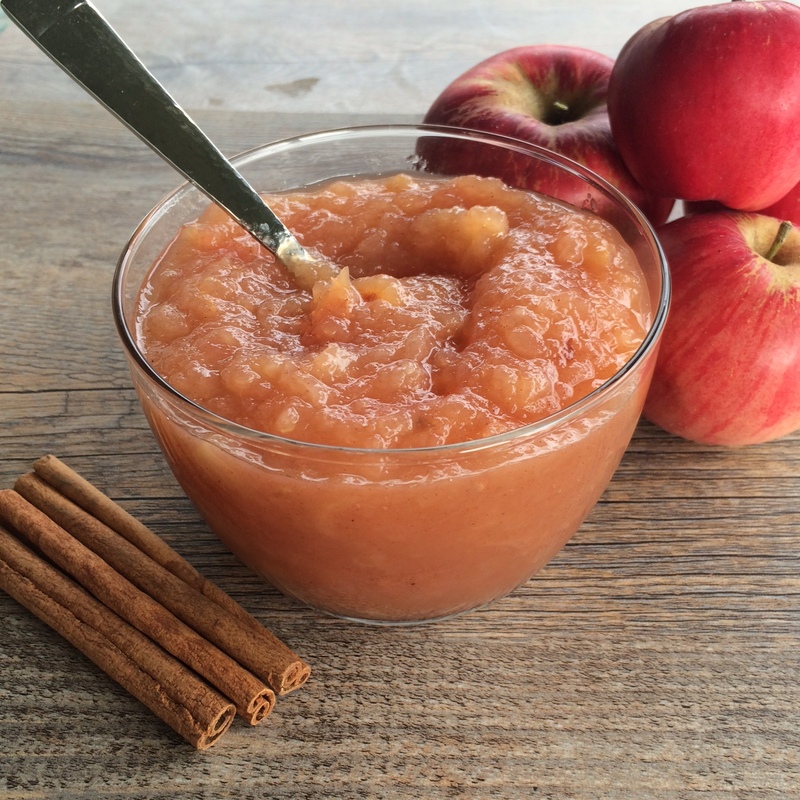 Our apples were very thinly sliced and cooked down to a perfect sauce, but if it’s a little too chunky for your taste feel free to add your applesauce to a food processor to smooth it out. You can serve the applesauce right away warm, or store it in the fridge or freezer (fridge for at least a week, freezer for a lot longer)! Add all ingredients to a large pot and cook over medium heat, covered, for about 25 minutes, stirring occasionally. Taste apple sauce and add brown sugar, adjusting the amount for the sweetness you like (you may need more of less depending on the sweetness of your apples). Stir in sugar and cook for another 5 minutes or so. Turn off the heat, stir again, and either leave apple sauce chunky or puree with an immersion blender or add apple sauce in batches to a blender or Cuisinart.